Dependable 2001 Isuzu, C250 Diesel. Engine access is located under the cockpit and is accessed via aft cabin or via quarter berth from the main cabin. Boat also has a galvanic isolator. Sails are in good condition. Spars-Wood, light and strong. The mast has a tabernacle for onboard lowering to enter low cruising grounds, or bridge clearance. The standing rigging is robust. Boat is equipped with two propane tanks located at the stern of the deck. The tanks supply the propane heater and galley stove. The boat is a self-built boat, built to plan over a 4 year period in Provo, Utah in fresh water by the original owner. The original owner had expertise in woodworking and welding. Boatshed does not independently verify measures and capacities, which are reported from seller-provided information and/or literature. This beautiful cutter has a spacious interior, with much more interior living area than other boats of the same length. A center cockpit provides access to the main cabin and access to the aft cabin. Once inside the main cabin, you will see the U-shaped galley starboard of the companionway with ample counter space, storage, stainless steel sink with brass fixtures. The gimbled stove/oven combination has two burners and there is a large icebox under the forward end of the large double size quarter berth on the portside that will keep ice for over two weeks when full. There is a large nav station on the portside with a beautiful wood finish and storage. The nav station includes a VHF radio and an HF Transceiver. As you move forward in the cabin, you will see the saloon, with a large fold-out solid wood table and settee's on both the port and starboard sides. There is a pilot berth above the starboard settee. The upholstery throughout is in excellent shape as well as the curtains. There are solid wood cabinets and drawers on the forward starboard side across from the single head. The head has a sink, toilet, and handheld shower. There is also a large bow locker. The wood throughout the boat is beautiful and well done. The aft cabin maintains the look and feel of the main cabin with fine wood finishes, painted shiplap on the ceilings. The aft cabin includes a double berth making a total of 7 sleeping berths, 5 in the main cabin from the settee, and pilot berth along with the large quarter berth that sleeps 2 and 2 in the aft cabin. Both the main cabin and the aft cabin have heaters. The aft cabin heater is a SIG Marine Propane Heater, the main cabin is a Force 10 Diesel Heater. Chain and warp length is unknown. The Spray 36 includes the following equipment located in the cockpit: Simrad autopilot, Navico depth meter, speed and wind meter and Uniden Marine VHF. Boat safety equipment includes 10 life jackets and quoting the current owner, "the most solid lifelines ever." The lifelines are substantial and in like new condition. The boat is also equipped with a high engine temperature and low oil pressure alarm systems. All new alarms were installed in July 2016. Safety equipment includes fire extinguishers, smoke detectors, carbon monoxide detectors, escape hatches, through-hull plugs and life raft. This Bruce Roberts Spray 36 is a sturdy and handsome boat, with historic lines. 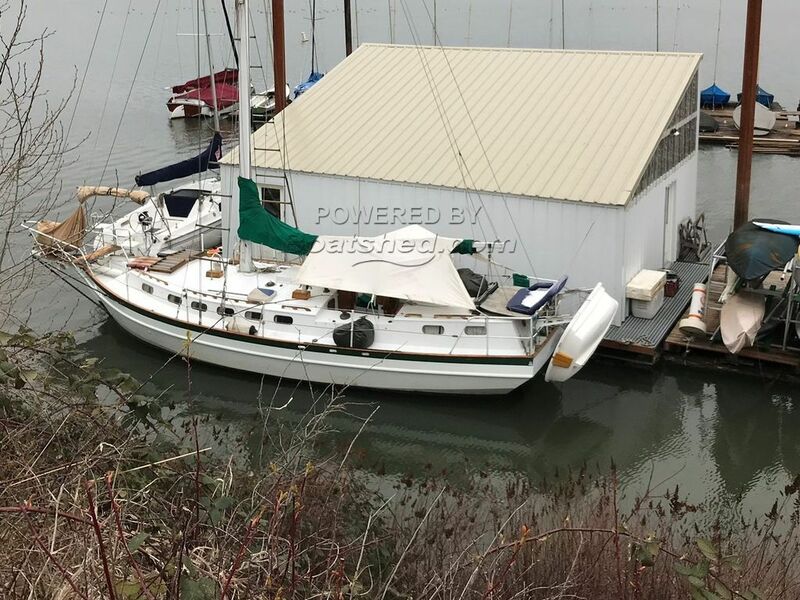 The second owner offered a history of the boat which was built in Provo, Utah in freshwater to the original Spray 36 plans with quality steel and woodworking throughout. With its shallow draft of just 4 feet, this boat can easily cruise on local rivers. It has also been up to more ambitious journeys; including a trip up to Alaska, then down the Pacific coast to the Columbia River and then upriver to Portland, Oregon. With its 12' beam, and ample accommodations and storage this boat could be your home away from home or even a nice liveaboard. 1) recently had bottom stripped to bare metal and painted with four coats of epoxy followed by three coats of hard bottom paint in 2016. Personal property is excluded from the sale of the vessel unless specifically included in the listing specifications above or in a Purchase Contract. Personal property may be equipment or gear not permanently attached to the vessel including but not limited to: artwork, entertainment equipment, fishing equipment, TV receivers, recreational equipment, kayaks, tools, and personal appliances. Photos may incidentally depict owners' personal property and are not intended to convey that these items are included in the sale of the vessel unless specifically listed herein. This Bruce Roberts Spray 36 Center Cockpit With Aft Cabin has been personally photographed and viewed by Teri Loporchio / Dave Carleson of Boatshed Seattle. Click here for contact details.